I'm pretty sure my dog would eat her food if we just piled it up on the floor and could care less what her food dish looks like. I however don't quite agree with her viewpoint of food is good no matter where it lays. I prefer to use a dish that looks good and is also functional. To be honest until we adopted Java not long ago I didn't really put a lot of thought into it either. But once I started looking I knew I wanted something that would be a good fit for her, and would be easy for me to keep clean. And that's why I went with dishes from Loving Pets. They have a really classy looking dish sets that won't make your dogs eating place stand out. They have a wide assortment of shapes and sizes of dishes too. The thing I really like is that each of the bowls in their two dish sets are removable. This way I can take them out and run them through the dishwasher at least once a week to sanitize them. And I can take her water dish right to the sink to rinse it out and refill it if her food falls in it during mealtime. They also have individual dishes that are really handy to have if you like to leave more than one water dish out for your pet. This is nice because when the kids are home they spend a lot of time downstairs in the family room and having the individual bowl gives Java a place to stop and have a drink if she's been playing hard with the kids so she doesn't have to run all the way back upstairs to the kitchen. And with the anti-skid bottom the bowl stays put on our tile floor even when she's lapping up the water. Wicker Dolce® Diner – These sturdy, simulated wicker diners include skid-free rubber feet that reduce scratching, noise, spills and slides. Dishwasher safe (after removing the rubber feet), Wicker Dolce Diners clean easily and feature removable, vet-recommended, bacteria resistant, stainless steel bowls. Available in three colors, two sizes per color. Dolce® Osso Double Diners – Beautiful translucent bone-shaped double diners practically glow. They feature skid-free rubber feet to reduce scratching, noise, spills and slides. The base and removable, vet-recommended, bacteria resistant, stainless steel bowls are dishwasher safe (just first remove the rubber feet). Dolce Osso Diners come in two designer colors, two sizes each. Bella Bowls® Classic and Metallics – Functional and beautiful, Bella Bowls are truly the perfect pet dish. Bella Bowls are veterinarian-recommended stainless steel interiors with an attractive poly-resin exterior. A removable rubber base prevents skids and spills, eliminates noise, and makes Bella Bowls fully dishwasher safe. Bella Bowls Classic and Metallics Collection are available in an expanding palette of decorative colors with our paws and bones design. 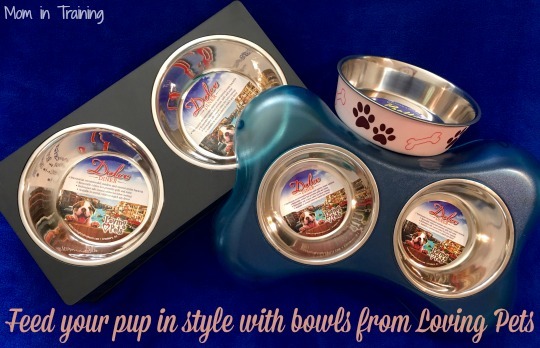 Bella Bowls Classics and Metallics Stainless Steel pet dishes come in four sizes, sure to be a perfect fit for your dog. I love the bowl set that's in the shape of a bone…that is too cute. I just got my Pug the purple bowl last week and it is great! It is like any stainless steel bowl, but it is way cooler looking, and wider. Her nose is not shoved in the food when eating. I bought the medium and put a cup of food in it, and it is perfect!!! It doesn't slide across living room carpet or any floor, she doesn't have to chase her bowl around anymore. I bought mine on Chewy. com if it matters. These sound and look like really nice bowls for pets. They sure would look a lot better than what I have to feed my dogs in.